Numerous studies suggest yogurt consumption is a signature of a healthy diet and lifestyle. 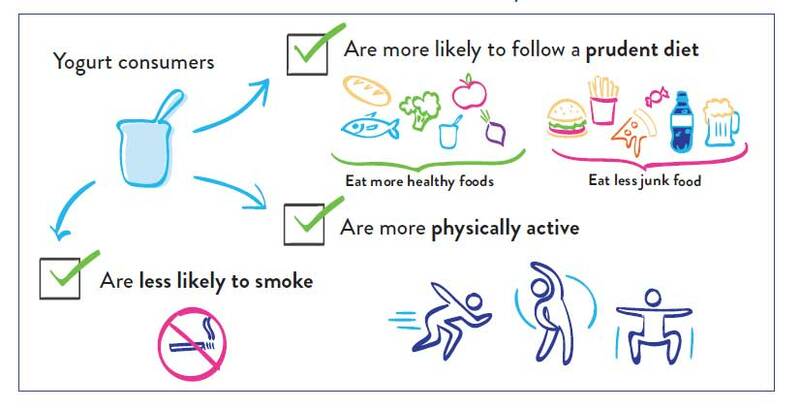 show healthier non-nutritional behaviour than non-consumers: they are less likely to smoke,19,26,31-33 tend to drink less alcohol and are more likely to be physically active in their leisure time than non-consumers. are more aware of the links between food and health, and are more likely to read food labels and less likely to go to fast food restaurants. tend to have a better health-related quality of life and mental health. Yogurt consumption is linked with a lower risk of a variety of chronic diseases. Williams EB, Hooper B, Spiro A, et al. The contribution of yogurt to nutrient intakes across the life course. Nutrition Bulletin 2015;40:9–32. Wang H, Livingston KA, Fox CS, et al. Yogurt consumption is associated with better diet quality and metabolic profile in American men and women. Nutr Res 2013;33:18–26. Zhu Y, Wang H, Hollis JH, et al. The associations between yogurt consumption, diet quality, and metabolic profiles in children in the USA. Eur J Nutr 2015;54:543–50. Panahi S, Fernandez MA, Marette A et al. Yogurt, diet quality and lifestyle factors. Eur J Clin Nutr 2017;71:573–9. Cormier H, Thifault É, Garneau V, et al. Association between yogurt consumption, dietary patterns, and cardio-metabolic risk factors. Eur J Nutr 2016;55:577–87. Hobbs DA, Givens DI, Lovegrove JA. Yogurt consumption is associated with higher nutrient intake, diet quality and favourable metabolic profile in children: a cross-sectional analysis using data from years 1–4 of the National diet and Nutrition Survey, UK. Eur J Nutr 2018. Lecerf J-M, Colin J, Hebel P, et al. Les consommateurs de produits laitiers frais : des consommateurs comme les autres? Analyse de leurs profils alimentaires et nutritionnels (Who are fresh dairy products consumers? Analysis of their dietary and nutritional profiles). Nutrition clinique et métabolisme 2016;30:11–21. Tremblay A, Panahi S. Yogurt consumption as a signature of a healthy diet and lifestyle. J Nutr 2017;147:1476S–80S. Possa G. Corrente JE, Fisberg M. Yogurt consumption is associated with a better lifestyle in Brazilian population. BMC Nutrition 2017;3:29. Possa G, de Castro MA, Marchioni DM, et al. Probability and amounts of yogurt intake are differently affected by sociodemographic, economic, and lifestyle factors in adults and the elderly – results from a population-based study. Nutr Res 2015;35:700–6. D’Addezio L, Mistura L, Sette S, et al. Sociodemographic and lifestyle characteristics of yogurt consumers in Italy: results from the INRAN-SCAI 2005–06 survey. Mediterranean Journal of Nutrition and Metabolism 2015;8: 119–29. Gopinath B, Flood VM, Burlutsky G, et al. Dairy food consumption and health-related quality of life in boys: preliminary findings from a 5-year cohort study. J Am Coll Nutr 2016;35:522–8. Thorning TK, Raben A, Tholstrup T, et al. Milk and dairy products: good or bad for human health? An assessment of the totality of scientific evidence. Food Nutr Res 2016;60:32527. Watch the livestream with Prof Tremblay! How to build healthy eating habits? How to include yogurt in daily diet and why? Yogurt, the signature of a healthy diet and lifestyle?